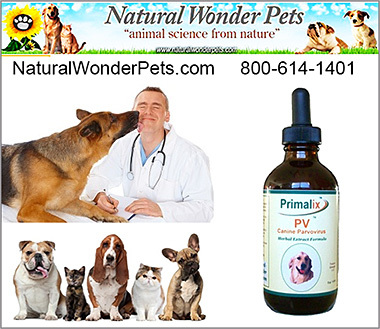 Primalix® PV for Canine Parvovirus gives your puppy a real chance to overcome Parvo! Parvo Treatment For Dogs and Puppies offers a real help for the deadly parvo disease. At the first sign of Parvo (lethargy, vomiting, etc) make sure to get your puppy to a vet and separate him from your other dogs. The treatments in this section offer a remedy of real hope. Products to naturally assist a dog with Parvo and to support him while recovering are in this section and should have a serious look. Make sure your puppy has a fighting chance. Get him to a vet and make sure these Parvo products are available to him or her.